In this time of webcams and affordable CCD cameras, we tend to forget that sketching is a simple, portable way of recording astronomical objects, especially planets. Sketchbooks don’t require cables, batteries or power cords. They don’t care which operating system you use, or whether you have RS232 or firewire ports. They can still be read decades later, long after the current electronic storage systems are obsolete. You also don’t need a big telescope system. 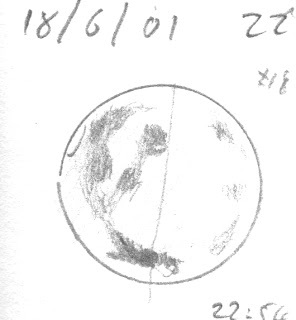 My first astronomical sketches were of the Moon, done through my Dad’s binoculars resting on my window sill. I’ve been sketching stars, planets and comets for years using a 115 mm reflector with no tracking. Almost anyone with an entry level telescope can sketch the Moon, Jupiter, Saturn, the later crescent phases of Venus and Mars at opposition. I even have sketched the sky as seen by my unaided eye to record movements of comets and planets. On the other hand, making sketches does require some minimal form of manual dexterity. Still, sketching planets and stars is an entirely different proposition to drawing the Mona Lisa, so if you can set up a telescope without tangling yourself in cables, you should be able to produce a satisfying and workable sketch. As with anything astronomical, a little preparation repays dividends at the telescope. Most people keep observing logs; it is very simple to combine an observing log with a sketch book. I use semi cartridge 110 gsm acid free drawing paper, A5 size in a spiral bound notebook. For me this is the right size for portability and ease of holding at the telescope. This sort of drawing paper can be found at all good newsagents or stationary stores. At the head of each page I write in headings for the date, time, observing condition (cloudiness, sky quality, wind conditions), and then I draw in observing blanks. These are simple circles where I will draw the image. This is a highly technical production; I use a 2B pencil and the eyepiece dust cap of my telescope to draw a number of circles. I find this just about the right size for reproducing what I see in the scope. More technically minded people can use a popular word processing program to make the blanks, but you really need a laser printer for printing the blanks. Inkjet print will smear when you handle it while sketching, and any trace of dew will wreak havoc. Also, if you are printing out pages, you will need a clipboard or solid surface to support your sheet while sketching. Having set up your sketching blanks, its worthwhile making sure you have two sharpened 2B pencils with you (or coloured pencils). If a pencil point breaks during sketching you don’t have to hunt around for a sharpener then. Now you are at the telescope, how are you going to actually sketch? After all, it is dark! I usually do my planetary observing in suburban locations where there is enough stray light to see the page (but not enough to degrade the planetary image), but if you are observing in dark sky sites, I find a hands-free LED headtorch, with red cellophane wrapped around it so your (and other peoples) night vision will not be affected, is ideal. It also helps with all the telescope set up that you do as well. LED head torches can be found relatively cheaply at bushwalking or sports stores, and red cellophane can be found at any newsagent. David Reidy and Ken Wallace recommend one of those booklights that you can clip to a book or clipboard. Experiment a little to find the best and most comfortable method for yourself. Now, you are at the eyepiece, pencil in hand poised above your planet blank, how do you actually start? I take a good look at the planet, memorize what I have seen, then glance down at the blank and quickly sketch in the major detail. As I wear half glasses for reading, I can wear the glasses at the telescope, look through the lens sans glasses, then look through the glasses at the sketch pad. I then look back through the scope, then back to the pad and sketch in more detail. I repeat this until I have built up a detailed sketch of the planet. You may find that the first time you look through the eyepiece, there is little detail, but don’t worry, just sketch out the main features and you will find that as your eye becomes adapted, you will be able to see more detail. Unguided scopes can be a bit of a pain, as you have to bring objects back into the eyepiece fairly often, but I spent most of my sketching career with unguided scopes, and you can still get good sketches. Made a mistake? Don’t panic, just start again, or use an eraser, to clear out the mistake. It’s worthwhile practicing a bit before trying your hand at planets. The Moon of course is ideal for practise, bright, full of detail, and you can start sketching in the early evening (planets like Jupiter, Saturn and Mars are best when highest in the sky, which is often inconveniently late). Once you have had a go at the Moon, planets should be a doddle. Try experimenting with coloured pencils,. Jupiter, and Mars at opposition, is particularly good for colour. Getting the shade right may be a problem (especially under redlight conditions). Again, don’t be afraid to experiment. Again, you are not limited to the telescope. 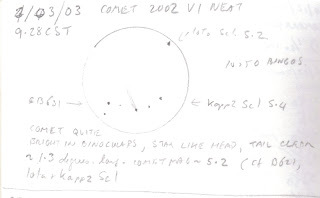 I have sketched through binoculars (good for asteroids and moderately bright comets, see the sketch of comet V1 NEAT sketch through binoculars to the left. I made multiple sketches over several days showing the motion of this comet), and with the unaided eye (bright comets, planetary motion etc. ), you are limited only by your imagination, a comfy chair and a good supply of sharp pencils. So pick up those pencils and get sketching! Occultation of Neptune by the Moon April 30. The Moon will occult the dim planet Neptune on the morning of April 30. This event will be seen in Far Northern Australia. The Moon will be just past last quater. Despite Neptune being only magnitude 8, this means that the reappearance at least will be observable in good (10x50's or better) binoculars as well as telescopes. The disappearance will be almost impossible to see against the bright Moon. The almost last quarter Moon will be low in the eastern sky when the occultation occurs. Neptune is the brightest object just below the Moon. The occulatation cannot be seen south of Bundaberg and Canarvon. In Darwin, Neptune will dissapear behind the bright limb of the Moon at 2:35 am and reappears from behind the dark limb at 3:42 am. One of the first rules in Occultation watching is "Don't sleep through your alarm". Unfortunately, I broke that rule. Fortunately, Smallest One woke me up around the time the occulation was about to finish by repeatedly poking me in the back. Anyway, here are some shots of Antares drawing away from the dark side of the Moon. Enjoy. Anzac Light on the water at Port Adelaide. A memorial to the the sailors of HMAS Sydney, recently discovered off the Western Australian Coast. The cardborad boats represent lifeboats, and have messages in honour of the sailors on them. The boats were made by South Australian School kids, Eldest Ones boat is amongst them, maybe even in this picture. Carnival of Space #51 is now up at Astroengine. There is Earth Day, ISS, our Obsession with Martian life, how to create your own Big Bang and much much more. So start your motors and head on over to Astroengine. 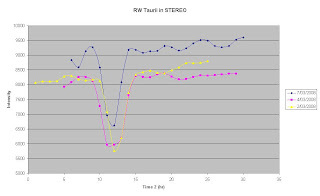 I realised after posting the RW Taurii light curve, that I should have posted the animation as well. Well, here it is. There is a lot of action and drama in that field. 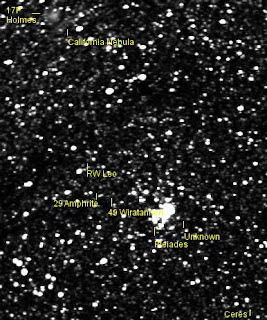 RW Taurii blinks on and off, 17P Holmes slides past the California Nebula (I posted an animation of an earlier section of this event before), 29 Amphrite trundles along, 46 Wiratanen zips past and Ceres proceeds majestically along the bottom. There is even an unknown object (probably an artefact, but my last "artefact" turned out to be 46 Wiratanen). Anyway, the Google Video is below, you can use the image to the right to help identify things (click to enlarge), but it is pretty cheesy. You can download a 1.4 Mb Avi, a 4.5 Mb Avi or a 3.5 Mb gif file which will have more detail. It is better to run the AVI's on a loop a 2x magnification to really get a good handle on the various blobs. Your probably getting sick of the "Watch Ian painfully learn photometery by trial and error" business, but you might be interested in this phase fold of the Algol type variable RW Taurii. It's around magnitude 8, so far more relevant to exoplanets, even though it has a much deeper eclipse than any exoplanet. I'm still having no luck trying to account for background drift. I've tried another method, averaging intensity over a patch of pixels, but that didn't work. I still have no way to normalize intensity over different STEREO runs. But the field was fantastic, in the stack, you can watch the California Nebula, see Comets Holmes and Wiratannen move across the field, see several asteroids including Ceres and Amphrite, as well as watching RW Taurii blink on and off. Rather nice indeed. 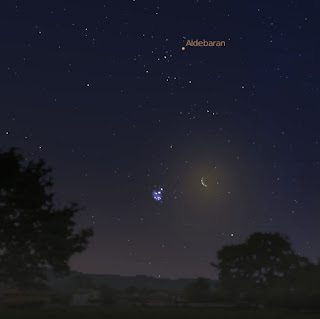 The Moon will occult (pass in front of) the bright star Antares on the morning of April 24. You can see this in Southern Australia in the early hours of the morning of April 24th (In WA the occultation occurs before midnight). The Moon will be four days after full and quite high in the sky. In New Zealand, the Sun rises around the time Antares comes out from behind the dark limb. This will also be a good event to watch in binoculars or a small telescope. On the East coast of Australia Antares disappears between roughly 2:45 am and 3 am , and reappears around 4am. In central Australia south of Alice Springs, it disappears around 2 am and reappaears around 3:15 am. in WA it disappears around 11:30 pm on the 23rd, and reappears just before 1:00 am. A full table of contacts for major Australian cities is here. A table with more details of this occultation, with contact times for other cities (mostly New Zealand) in UT time are here. I'm still trying to figure out how to reduce the variability of intensity measurements in the STEREO Secchi instruments so as to see if I can pick up exoplanet transits. One way is Phase Folding, as used by various groups to study stellar variability. What one does is observe several transits, then alignig all the values with respect to the transit maximum. As the transit maximum will drift, the pints will not align perfectly, so you don't reduce variability per se, but they will define the peak more clearly. 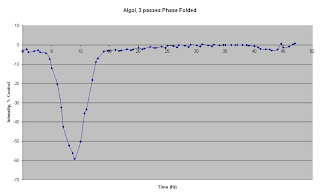 Compare the image here, made of 3 passes of Algol phase folded, to the Algol peak defined here on a single pass. Algol is an easy target, but it lest me practise my alignment without hunting for a week trying to find the blasted star. Not also the subsidiary dip. The main dip is when the cool dim star passes in from the the bright star, the subsidiary dip is when the cool dim star is hidden behind the dim star. There's still a few issues. Even for a bright star like Algol, it's measured intensity is quite different between satellite runs, and I have no clear idea of how to normalize this. Also, the more runs you can fold in, the better your sensitivity. However, 83 Leonis has a long period of 17 days, and you only get two passes in STEREO per year. Still, I'll have another go with Phase folding and see what I can come up with. Is this a tranisting exoplanet? This is an intensity trace of 83 Leonis (HD190360 click image to enlarge) assembled by stellar photometry from STEREO images, taken over the time of a predicted transit (17-18 August 2007). 83 Leonis is known to harbour a transiting Saturn-sized exoplanet (well, sort of, no one has actually seen a transit yet, but it is predicted to transit). It is a good STEREO candidate as it is fairly bright (magnitude 6.5) almost slap bang in the middle of the Secchi H1 field (where there is less distortion) and it has a fairly deep transit (which should rise above the inevitable noise). So, the trace shows what appears to be an observable dip in intensity. The dip in intensity is roughly the right depth (1% vs predicted 1.95), the minimum is close to the predicted minimum, but the dip is a little too broad (the transit should be 4 hours wide, this is more like 6). And it is noisy, especially the early measurements, during the 17th. The noise suggests this is all artefact. Of course, I've compared the trace from 83 Leonis with nearby stars of similar magnitude (80 Leonis, A2777 etc. ), and they are also, ahem, noisy. One thing they all seemed to have in common (apart from a bucket load of noise), is they all seemed to be going up in intensity when 83 Leonis was going down and down when 83 Leonis was going up. So I averaged the values from the 4 stars closest in brightness to 83 Leonis (the dimmer stars were more variable), and compared the average to the 83 Leonis trace. I should explain that to make these figures I have taken the raw intensities, subtracted the background, then expressed them as a percent of the average of the last six raw intensity values (you can use the last value, or the average of all values, the pattern is the same). You can't effectively compare the raw traces as they differ substantially in intensity (for 3000 to 9000 arbitrary intensity units). Expressing everything as a percentage change in intensity makes them comparable. Now the values can drift because of differences in pixel sensitivity, effects of coronal mass ejections, systematic differences in the regions of the chip and just plain randomness. If the changes in intensity in the stars on the chip of the H1 imager are random, then averaging them out should cause the values to regress to the mean. If there is systematic error, this should be picked up by averaging too. The stars I've picked are all close by 83 Leonis (within about 1 degree), so the local conditions should be pretty similar. 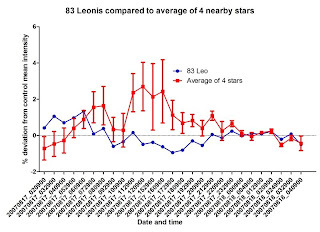 Anyway, what you can see is that the other stars do behave differently to 83 Leonis. 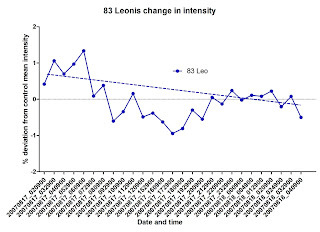 If there was some systematic effect, 83 leonis's trace should follow the averaged traces. More importantly, the "dip" in the 83 Leonis trace is outside of the error bars for the other stars, suggesting that the dip in the trace for 83 Leonis is bigger than what one could expect from random variation. So maybe, just maybe, this might be a real exoplanet detection. Or maybe I'm just chasing errors. After all, what I know about astrophotometery could be written on a postage stamp. So if anyone has good ideas for generating pseudo flat fields and darkframes from the STEREO images that a mathematically challenged biologist can understand, drop me a line. Now I'm going to take a break. It's taken me a month to assemble the images, find freaking 83 Leonis (a post about that later) and do the photometery and analysis. Plus my sister-in-law and family are visiting. Catch you later. I gratefully acknowledge the assistance and helpful discussion from Professor Glenn White of the Open University, Professor Greg Laughlin and Comet Al. Without these folks I wouldn't have known where to look or how to begin analyse my data. Carnival of Space #50 is here. Carnival of Space #50 is up at Kysat. There are rocket races, space tourism, stunning pictures of Phobos, thoughts on Dark Matter and much, much more. So race on over and have a look. 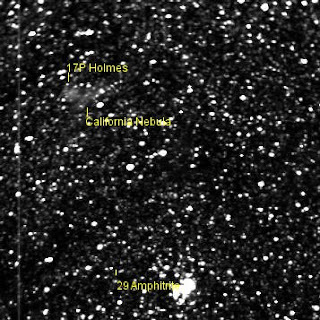 Between 26 February and 7 March the amazing Comet Holmes scooted past the California Nebula. I was unable to see it from my southerly location, but the Stereo Secchi imager H2a got some shots of it. It's not as good as these amazing images by Dave Kodama, (see also here and here) and by Rolando Ligustri, but hey, they will do for me (the big blob is the Pleiades). I've posted an animation below, 29 Amphrite is also in the frame, but it's hard to see in the Google Video, you are going to have to download the avi (1.1 Mb) from here, and then run it at 2x magnification to see this asteroid easily. Just below Amphrite is what appears to be another asteroid, but nothing appears on my star maps. An artefact or a real unknown object? (update: Comet Al has identified this as 46P/ Wirtanen) 1 Ceres was also clearly visible, but is outside the area of this animation. In making these images I've just updated ImageJ to version 1.39u, and it rocks! Finally got the Z profiler to work, and the Astrometry program is sort of working, so I will have another go at exoplanets real soon. So much irony, so little time. I normally do my evolutionary posts over at the Panda's Thumb, but given the astronomical nature of this item, it really belongs here. Ken Kev Miller is the screenwriter of the ID propaganda film Expelled. He's been carrying on about how consensus in science is repression. Apart from the irony of quoting science fiction author and global warming denier Michael Crichton as an expert on the role of consensus in science*, there is a complete lack of understanding of the history of science. Miller makes this jaw dropping statement. By your logic, it was right for Galileo to be persecuted for his views, because the overwhelming majority of astronomers were certain that geocentrism was right and heliocentrism was wrong. The evidence was just so overwhelmingly obvious. The same goes for virtually any other scientist that revolutionized his discipline. Can't these people get their history right? If you would have polled astronomers in 1610, after the publication of Sidereus Nuncius (The Starry Messenger) and well before Galileo fronted the inquisition or was persecuted, you would have found that most astronomers would regard the Copernican heliocentric model as computationally convenient. It made predicting planetary positions easier, having got rid of many (but not all) of the epicycles that bedeviled the Ptolemaic geocentric theory (for a series of Java animations that illustrate geocentric theory, see here). It also provided a natural explanation for retrograde planetary motion. On the other hand, stellar parallax had not been observed, and with the Copernican system there was no obvious replacement for the system of Aristotelian physics that, for example, produced gravity, so its status as an explanatory theory was not firm. However, Galileo's observations of the Medician Stars and his work on physics significantly dented Aristotelian physics, making the Aristotelian argument against Copernicanism less compelling and throwing open the geocentric question again. This was a time of great ferment in astronomy as astronomers made their own telescopes and confirmed Galileo's observations while making new observations of their own. One thing we can definitively say about this time was that there was no consensus amongst astronomers, in the sense of our modern consensuses about relativity, quantum mechanics, evolutionary theory or global warming. In Italy, there were more geocentrists than heliocentrists, but in Germany it was the other way around. Then Galileo discovered the Phases of Venus, and the Ptolemaic geocentric system was effectively dead from then on. There was no way the phases of Venus could be compatible with a Ptolemaic geocentric system. By the time Galileo first fronted the inquisition in 1616, the Ptolemaic geocentric system was consigned to the trash heap by almost every astronomer. The big battle was between the Tychonian geocentric system, where all the planets except Earth orbited the Sun, and the Sun orbited the Earth. This system was mathematically equivalent to the Copernican system, but was obviously a kludge, and furthermore, broke Aristotelian physics. It was definitely not “overwhelmingly obvious” that the Tychonian system was supported over the Copernican system. Where were the astronomers when Galileo fronted the inquisition for the first time? Right behind him. The Academy of the Lynxes, the Italian equivalent of the American Association for the Advancement of Science, or the Australian Academy of Science, supported him against the church in both confrontations with the Church, the lesser known 1616 meeting, and the iconic 1633 heresy trial. Ironically, shortly before Galileo fronted the Inquisition for the second time, a transit of Mercury had been observed which verified the predictions of Kepler’s heliocentric, elliptical orbit system. By the time Galileo was receiving his sentence (and legend has it, muttered “E pur si mouve”, “but it does move”), Kepler’s "Epitome of Copernican Astronomy” was on its way to being the best selling Astronomy text in Europe. It took some time to provide a definitive observation of the Earths rotation, and longer still to demonstrate stellar parallax, but by the time of Galileo’s trial there was unequivocally no consensus that geocentrism was right, with no overwhelming evidence supporting geocentrism. Indeed, it could well be argued that by the time of Galileo’s trial, and during most of Galileo’s time of persecution (if you take 1616 as the start of his persecution, rather than the beginnings of the call to be tried for heresy) the balance was well and truly tipped in favour of heliocentrism in Europe overall. Ironically, it wasn’t astronomers who were persecuting Galileo (even though he did have some very vigorous arguments with some astronomers), it was the Church. A point Ken seems to have forgotten. Then again, history is beside the point really. No one, least of all Wesley Elsberry, is claiming people should be persecuted for not accepting the consensus. Heck, in science people reject the consensus all the time (look at Fred Hoyle for example). But if you reject the consensus, there is no obligation of anyone to listen to you unless you bring data to the argument. Galileo bought lots of data, he had reams of falsifiable observations and experiments. He deeply engaged with the scientific community of his time, with extensive correspondence on things such as construction of telescopes (so people could check his claims). His work inspired scientists of that age, and lead to much fruitful research, essentially establishing modern science. In contrast, the Intelligent Design people actively shun engagement with the scientific community, have produced no data, just arguments from ignorance and waving lots of big numbers in the air (see also here, here, here and here). Yet they moan and carry on when scientists ignore them. Sorry folks, being ignored is not persecution. You can't even get to the first part of "It is not enough to be persecuted to wear the mantle of Galileo, you also have to be right". Ironically, while Galileo was being persecuted, he produced Discourses and Mathematical Demonstrations Relating to Two New Sciences, possibly the foundational document of modern physics. In contrast, the intelligent design movement has come up with a couple of pop-culture, data free books (see here). Galileo? I don't think so. *What is it with these people, ID supporters turn out to be global warming deniers and HIV deniers as well. Is there no pseudoscience they don't like? The Moon, Saturn and Regulus tonight. Regulus is the faint dot right next to the overexposed Moon (no, the won't go in front of Regulus tonight, but it will get very close). Saturn is the bright dot off to the left. Rummaging around on the intertubes, I found that the canonical geek web comic, xkcd, has a blog (or blag as he calls it). Now, I find xkcd to be side splittingly funny (and insightful), but it’s not to everyone’s taste. Nonetheless, I think you might find this discussion of laser elevators relevant to my previous laser pointer post . A laser elevator is where you use laser to lift an object into orbit (or power a star sail). The Northern horizon as seen at 8 pm on Tuesday April 15. 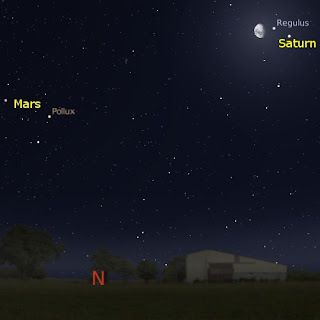 Another close approach of the Moon to Regulus and Saturn. Should look quite nice too. Mars forms a triangle with Castor and Pollux, as an added bonus. Image Credit: NASA/JPL-Caltech/University of Arizona . 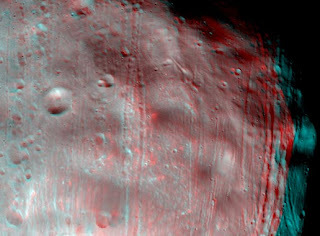 Quick, grab some red/blue 3D glasses and lok at this image of the Martian moon Phobos. Then go "Wow" like I did. The image really pops out at you. For more info, a bigger and even more stunning 3D image and some more detailed images, pop over to the Mars Reconnaissance Orbiter site, and have a look at their stories on Phobos and Phobos in stereo. Also have a look at Tom's take on the story. Carnival of Space #49 is here. Carnival of Space 49 is now live at Will Gater's blog. Lots of Mars themed posts this week, with a stunning animation of Victoria crater, supernova, kids questions and Dyson Spheres. Head on over for these chronicles. On the weekend the Bettdecker erschnappenderweisle looked up and said, "those clouds look fantastic through polaroid glasses". And they did. I tired to photograph them with and without a polaroid filter over the lens, but the effect wasn't as dramatic as it was visually. The clouds still look pretty spekky though (click image to enlarge it). An aide runs into the office of the US president and pants "Mr. President, the Russians are painting the Moon red!". The president just nods and keeps on working. A little while later the aide runs in again "Mr. President, the Russians have painted half the Moon red!" The president just nods and keeps on working. Finally the aide runs in "Mr. President! The Russians have painted the entire Moon red!" The president looks up and says "Now get those NASA boys on the phone and get then to take up some white Paint and write "Cocoa-Cola" up there." This joke came back to me as I was watching a news item about the local Adelaide idiot who was arrested and sent to jail for nearly three years for shining laser light into a helicopter pilots eyes. This comes on top of a series of laser pointer attacks on aircraft coming in to land at Sydney airport. Uh, why you ask, does this remind me of that joke, there is nothing remotely funny about this? What is the connection? Now, my mind runs in all sorts of tangents, but there is a connection. The connection is the idea that you could try and paint the Moon with laser pointers. Of course, it turns out to be impractical, as almost every person on Earth would need around aim 100 million laser pointers at the full Moon to colour it. This in turn bought to mind the US beer company Rolling Rock's "Moonvertising". Yes, I know it can't work as they state it (come on, it's a PR stunt for a beer company for goodness sakes! They can't even get their diagram of the Moon right, so even if they had a ginormous laser, they couldn't aim to write anything, and yes, I know the Bad Astronomer has already blogged this, but let me have my moment in laser illumination). Now, the idea of advertising using space objects isn't new, it has been used by Arthur C Clarke in "Watch This Space" and Issac Asimov's "Buy Jupiter", and there has been the odd April fools joke before, and an Advertise on the Moon site (could be a hoax that one). Is it feasible? Yes, for a suitably expensive definition of "feasible". The Rolling Rock, Advertise on the Moon and Laser Pointer scenarios all use the full Moon for a target. The full Moon has a number of advantages. It's visible all night, it is uniformly illuminated, so you could use the whole face of the Moon without contrast breaking things up. On the downside, the illuminated Moon is bright, your laser has to overcome the light already reflected by the Moon. Also the Moon is SMALL, around 0.5 degrees wide, you can cover it's image with your thumb. So you are not going to be able to get any sophisticated image or text up there. Under the "Paint the Moon" scenario you need to cover the entire Moon surface, and Julian calculated (under simplifying assumptions) that you would need 6.6 × 1017 watts to do the trick (That is nearly an exawatt). The most powerful laser available is 500 Terawatts formed from combining 192 laser beams. This is about 100 times too weak to do the job, even if all the laser beams weren't plugged into an experimental fusion reactor. But for an ad we don't need to paint the entire Moon. We just need to illuminate a smaller spot. To illuminate a single dot on the Moon that is visible from Earth is a lot easier. Especially if we aim our laser at the unilluminated part of a crescent Moon. Patricia Daukantas at the Optics and Photonics News Blog calculated that you would need (depending on your assumptions) between a 1 to 100 Giggawatt laser to produce a visible dot on the unilluminated part of a crescent Moon. 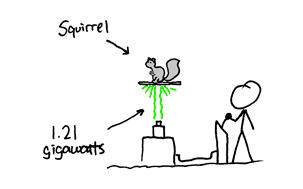 This is a lot more feasible than a Terawatt laser, and there are a few gigawatt lasers lying around. They just produce these levels for less than a picosecond (that's really, really short). If we want to make an advertising message on the Moon, we need to drive that spot along the surface, to form a raster image like on a television screen. So the dot has to last a lot longer than a picosecond. You could get around this by firing a lot of gigawatt lasers in sequence, but as need around 2.5% of the total US energy consumption to power one of these lasers, you are looking at quite an energy bill. So the answer to "is it feasible" is "yes, sort of", if you are willing to hijack a whole bunch (possibly the entire Earth's supply) of major experimental lasers and have the GDP of a small European nation in disposable cash to pay for the power, for an add that can only be seen on a handful of days when the Lunar crescent is sufficiently small to not interfere with the visiblity of the dot on the dark side, for a few hours before the crescent Moon sets. (new Moon and one day old Moon's won't work as they too near the Sun, and the spot will be lost in the sky brightness). Good luck with that. Of course, seeing as the "missile killer" lasers are only around the megawatt range, the local aviation authorities might object to firing gigawatt lasers anywhere near flight paths (and the Birdwatchers probably wouldn't be too happy with all the fried wildfowl generated). Still, they are minor difficulties compared to what you will have to go through to get the lasers. It had better be a good logo. Anyway, as you are reading this, lasers are bouncing off the Moon. They are bouncing off the mirror cubes (disco is good for something) left behind by the Apollo astronauts. 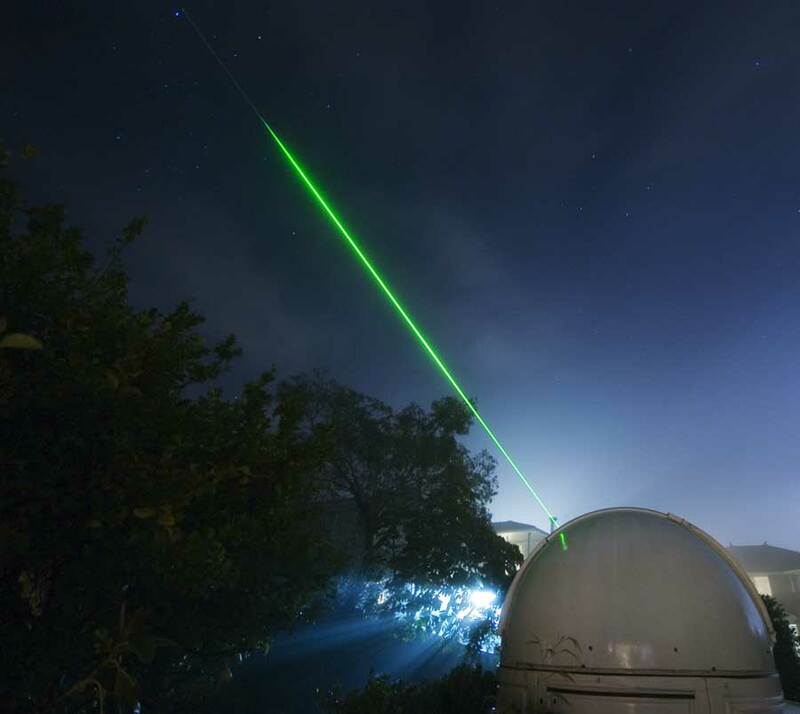 Of course, you need a 3.5 meter telescope and really good photomultiplier's to detect these laser beams, and no one is making beer adds with them, but it is nice to know that they are there. My friend Sneedleflipsock sent me this link to a wonderful map of the southern skies, check out the Southern Cross at the bottom. The western evening sky an hour after sunset, as seen from Australia. On the early evening of Wednesday, April 9, The crescent Moon will be not far from the delightful Pleiades cluster. This will be best observed around an hour after sunset, when the sky is dark enough to see the Pleiades properly. However, they will be fairly close to the western horizon, so choose a clear, level spot to observe from. Venus and mercury close together on the morning of 26 March, taken from my Mum's place. Mum has the radio alarm go on at 5:30 am, so it's easy to wale up. So must the rest of the neighbourhood, I could hear the radio from the street as I took this picture. 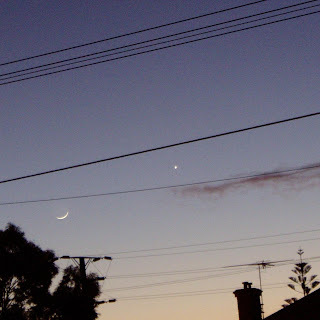 It's been a bit of a heavy week here at Chez Reynella, so when I rolled out of bed this morning in a sleepy haze I found that I had a very short time to catch the conjunction of the Moon, Mercury and Venus. I staggered out into the morning, and after a moment I realised that the sky wasn't covered with cloud, as it has been for the past few days. S0 I dug out my camera and headed out into the street to catch the planets. While the sky wasn't covered in cloud, there was an inconvenient patch just where the Moon and Venus was. Fortunately, the cloud moved away and I was able to catch the three before the sky became too light. Then it was off to wake Eldest One to go to his cricket match. Where is Mercury, you ask?Look carefully at the image (you may need to click on it to enlarge it) and you will see Mercury peaking out from behind the chimney on the lower right. It's easier to see in the animation below. Carnival of Space #48 is here. Carnival of Space # 48 is over at The Next Big Future. There are stories on Mars, Red Dwarfs, Astronomy meetings, 2001, Forbidden Planet, Dr Who, aliens that could hide their solar system and much, much more. Book a ticket now an head on over. Oh, and Carnival of Space will be one year old next week. Keep a look out for extra special posts then. Google Earth is good for many things astronomical. The latest use of this collection of Satellite maps is the discovery of a recent impact crater in Western Australia. The crater is around 260 metres wide and 30 metres deep, and is thought to be between 10,000 and 100,000 years old. You can read versions of the story at The Age, and the Sydney Morning Herald. The Moon, Venus and Mercury, April 5. 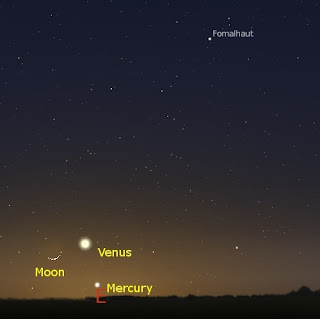 On the morning of Saturday April 5, the Moon, Venus and Mercury will be very close together. This will make a very attractive predawn sight. The diagram shows the eastern horizon as seen from Adelaide at 6:45 am local time, but similar views will be seen from most southern hemisphere locations half an hour before sunrise. The trio will be reasonably close to the horizon, so it is best if you have a clear, level eastern horizon.